Aphids, leafminer, mealybugs, thrips, whitefly (Ellis; Bradley, 1996: p. 449), armyworms, bollworms, cabbage worm, codling moths, corn borer, cutworm, DBM, fruitworm, leafhopper nymphs and eggs, potato beetle, scale insects, spider mites, and caterpillars of most pest moths. If given the chance, they can also prey on adult pests. Eggs are found on slender stalks or on the underside of leaves. Each egg is attached to the top of a hair-like filament. Eggs are pale green in color. Larvae are known as aphid lions. Newly hatched, they are grayish-brown in color. Upon emerging, larvae immediately look for food. They grow to about 1 cm in length. They attack their prey by taking them with their large sucking jaws and injecting paralyzing poison, and then sucking out the body fluids of the pest. A larva can eat 200 or more pests or pest eggs a week. An older larva can consume 30-50 aphids per day. It can consume more than 400 aphids during its development. The larvae resemble alligators with pincers like jaw. However, they become cannibalistic if no other prey is available. They feed for 3 to 4 weeks and molt three times before pupation. They cover their bodies with prey debris. Pupae are cocoons with silken threads. These are found in cracks and crevices. The pupal stage lasts for approximately 5 days. Adults are green to yellowish-green with four, delicate transparent wings that have many veins and cross veins. Adults are about 18 mm long, with long hair-like antennae and red-gold eyes. Each adult female may deposit more than 100 eggs. 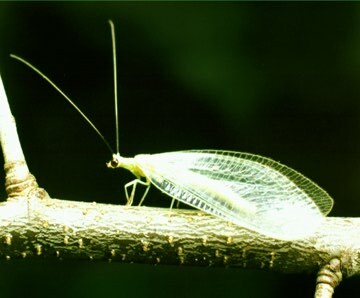 Many species of adult lacewings do not prey on pests. They feed on nectar, pollen, and honeydew. An adult will live for about four to six weeks depending on the climatic conditions. Flowering plants such as dill, cosmos, sunflower, carrots, dandelions are good source of pollen and nectar for adults. Provide source of water during dry season.